Jim Arnold, first director of the New Lanark Heritage Trust and largely responsible for the preservation of the site where Robert Owen ran the mills. 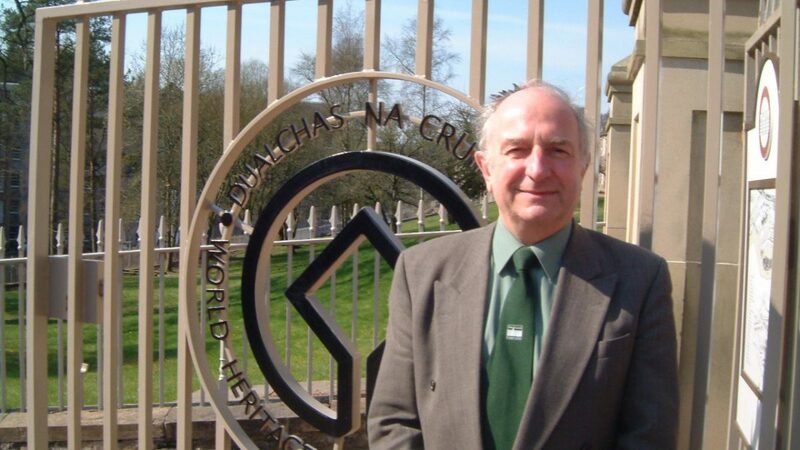 Claudia Beamish MSP and Ged Killen MP have tabled motions to the Scottish Parliament and Westminster Parliament respectively to mark the passing of Dr Jim Arnold, former director of the New Lanark Trust and responsible for preserving the hugely important New Lanark site. Iain Macdonald, trustee of the New Lanark Heritage Trust and former Secretary General of the International Co-operative Alliance, has contributed the following obituary. Jim Arnold was one of the people most responsible for the resurrection of New Lanark, arguably the birthplace of British co-operation. It is hard to believe that he has been taken from us. Jim had been associated with New Lanark since 1974 and was its first director from then until 2010. The work he undertook from a semi-derelict village to UNESCO World Heritage Site inscription was quite astonishing as recognised by his many awards including an MBE and an honorary doctorate and degrees from the Universities of York, Strathclyde and the Open University. In 1987 he was presented with the Europa Silver Medal, a major European conservation award for the restoration of New Lanark. He was undoubtedly one of the most important figures in industrial heritage in the UK, if not the world. As a committed co-operator, he passionately believed in preserving the memory of Robert Owen and highlighting the relevance of his work today. Jim believed that, as a father figure of cooperation, trade unionism and the Labour Party, Owen’s relevance could not be more important to the co-operative and labour movement today. However Jim didn’t just operate at the dizzy heights of UNESCO. During the 80s and 90s, I persuaded Jim to support the revitalisation of co-operative democracy in Scotland by serving on the CWS Larkhall committee, (later the Lanarkshire Area Committee) one of many such committees in a Scotland largely abandoned by the CWS of the day and a mockery of serious democratic involvement. With Jim‘s commitment and others like him, we dragged the CWS into the 20th century, returning the co-op to its members, where it remains, more or less, today! Quite recently Robin Stewart, Graham Melmoth and I enjoyed a very pleasant evening with Jim in the New Lanark Hotel, which is in itself, a testimony to the work of Jim Arnold. Jim is sadly missed but he remains forever a giant in the history of industrial heritage, New Lanark and the co-operative movement.